Just Moved Ministry, through our ministry Operation Hope for the uprooted military family, will donate a complete After the Boxes Are Unpacked study to any military chapel that will supply a facilitator. 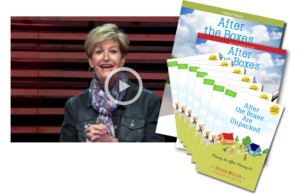 The Operation Hope kit includes the 3-disc, 12-session Video Series, a Facilitator Guide, and 7 copies of Susan Miller’s book, After the Boxes are Unpacked. Our cost for each donated kit is $350. All donations are welcome and when you donate $350 or more, you become a sponsor for a military chapel and will be offered specific ways to pray for the women and families there. Thank you for your partnership in bringing hope to the uprooted military family. Complete an application to receive your Operation Hope kit.